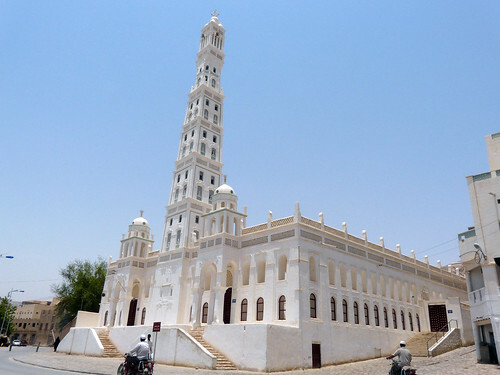 The 53 metres (175 ft) high minaret of the Al Muhdhar Mosque at Tarim, Yemen is World's tallest mud earth building. The mosque constructed in 1914/1915 is made of sun dried mud-brick, with its walls painted to protect it from weather. It was designed by the local poets Abu Bakr bin Shihab and Alawi Al Mash’hūr. The mosque is named in honour of Omar Al-Muhdhar, a Yemeni leader who lived in the city during the 15th century. Tarim was famous in the past for its scientific, religious schools which still attract students from all over the world today. At one time it had 360 mosques; unfortunately about half of these are in ruin now. It is amazing how you discover & share the info about these unique structures through out the world. It helps me in planning my trips as I travel the globe. Keep up the good work.